Fight on behalf of the Emperor this Halloween season in this stormtrooper mask. The adult, PVC mask is painted white with black and blue accents. It covers half of the face and provides slits for easy seeing and breathing. 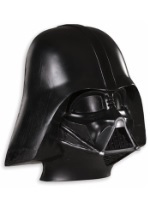 This mask is a cheap addition to any of our stormtrooper costumes.